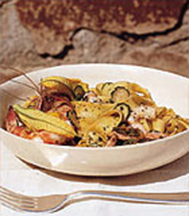 Seafood, seasonal vegetables and pasta are a common combination in Tuscany. This is a summery version that Benedetta Vitali serves at Zibibbo, using firm, dark green zucchini. In a small saucepan, cover the shrimp shells with the water. Add the sliced celery and carrot and boil the shrimp shells over high heat until the liquid has reduced to 1 cup, about 20 minutes. Strain the shrimp stock through a fine-mesh sieve into a small bowl, pressing hard on the solids with the back of a spoon to extract the liquid. Season the shrimp stock with salt. In a large pot of boiling salted water, cook the fettuccine until just barely al dente. Drain the fettuccine, reserving 1/4 cup of the pasta cooking water. In a large, deep skillet, heat 3 tablespoons of the olive oil until shimmering. Add the sliced zucchini and garlic and cook over high heat, stirring frequently, until the zucchini is just softened and beginning to brown, about 5 minutes. Add the shrimp stock, fettuccine, shrimp, tomato sauce, basil, oregano and the remaining 2 tablespoons of olive oil. Add a pinch of crushed pepper and simmer over moderate heat, tossing constantly, until the shrimp are pink and the sauce is nearly absorbed, about 4 minutes. Add the torn zucchini blossoms and toss just until they are wilted. Stir in the reserved pasta cooking water and season the fettuccine generously with salt and pepper. Transfer the fettuccine to a large serving bowl and serve immediately. For pasta dough: Whisk flour and semolina in medium bowl to blend. Add eggs and stir with wooden spoon until mixture clumps together; turn out onto floured surface and knead until dough is smooth, adding more flour by tablespoonfuls if dough is sticky, about 8 minutes. Form dough into ball; cover and let rest 1 hour. (Can be made 1 day ahead. Wrap in plastic; chill. Let stand at room temperature 1 hour before rolling out.) For filling: Heat oil in heavy large skillet over medium heat. Add onion and sauté until soft, about 8 minutes. Stir in radicchio and wine; sprinkle with salt. Reduce heat to medium-low; cover and cook until radicchio is very soft, stirring frequently and adding water by tablespoonfuls if dry, about 40 minutes. Uncover and sauté until all liquid evaporates, about 5 minutes. Remove from heat and cool. Mix in mascarpone cheese. Season with salt and pepper. Cut pasta dough into 6 equal pieces. Cover pieces with plastic wrap to keep from drying out. Set pasta machine to widest setting. Flatten 1 dough piece into rectangle. Run dough piece through machine. Fold in half crosswise (end to end) and run through again. Continue to run through machine, turning machine to narrower settings after 2 passes and dusting with flour as needed to keep from sticking, until pasta sheet is scant 1/16 inch thick (about last setting). Place pasta sheet on lightly floured work surface; cover with plastic to keep from drying. Repeat with remaining pasta pieces. Working in 2 batches, cook ravioli in very large pot of boiling salted water until just tender, stirring gently to prevent sticking, about 3 minutes. Drain. Transfer ravioli to bowl. Pour hot melted butter over; sprinkle with salt, pepper, and Parmesan. Toss gently and serve. Cook cauliflower and broccoli in large pot of boiling salted water until crisp-tender, about 5 minutes. Drain, reserving 2/3 cup cooking liquid. Transfer vegetables to large bowl. Cool. Rinse spinach, then toss in large nonstick skillet over medium-high heat until just wilted. Drain and cool. Squeeze spinach dry; finely chop. Melt butter in heavy medium saucepan over medium heat. Add flour and whisk until smooth, about 2 minutes. Gradually whisk in milk and reserved 2/3 cup vegetable cooking liquid. Whisk constantly over medium heat until sauce thickens and boils, about 3 minutes. Stir in spinach and cheese. Using fingers, coarsely crumble cauliflower and broccoli in bowl. Add spinach béchamel sauce; stir to blend. Preheat the oven to 425°. Set the peppers in a roasting pan and roast, turning occasionally, until blackened in spots and softened, about 30 minutes. Transfer to a bowl, cover with plastic wrap and let stand for 30 minutes. Peel, core and seed the peppers, then cut them into 1/2-inch wide strips. In a bowl, toss the peppers with 1/4 cup of the olive oil, 3 tablespoons of the parsley and half of the garlic; season with salt and pepper. In a medium bowl, whisk the ricotta until creamy. Whisk in the remaining 1/4 cup of olive oil, 3 tablespoons of parsley and half of the garlic along with the mint, jalapeño and thyme; season with salt and pepper. Mound the ricotta in the center of a plate. Arrange the pepper strips around the ricotta, spoon the pepper juices on top and serve with crusty bread.